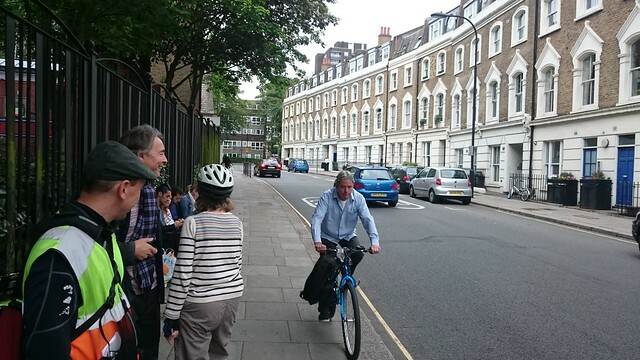 On Saturday 13th June 2015, Steven Edwards led our seventh inspection ride – around Gospel Oak. Saturday 13th June 2015. A group of 6 cyclists inspected the streets in Gospel Oak: Susan Seymour, George Coulouris, Jean Dollimore, Katrin Wedepohl, John Lowe and Steven Edwards. 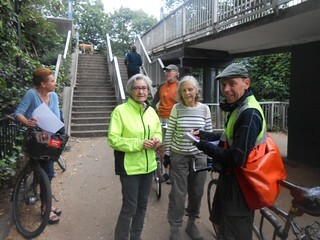 We met at Savernake Bridge, where we considered the impediment to people on bikes caused by the somewhat bizarre decision to forbid cyclists from riding on the ramp – expecting cyclists of any age, ability or disposition, whether carrying children or riding Christiana-type bikes to haul their bikes up the steps (with the ‘aid’ of a ‘wheel channel’!) if they don’t want to walk on the ramp. 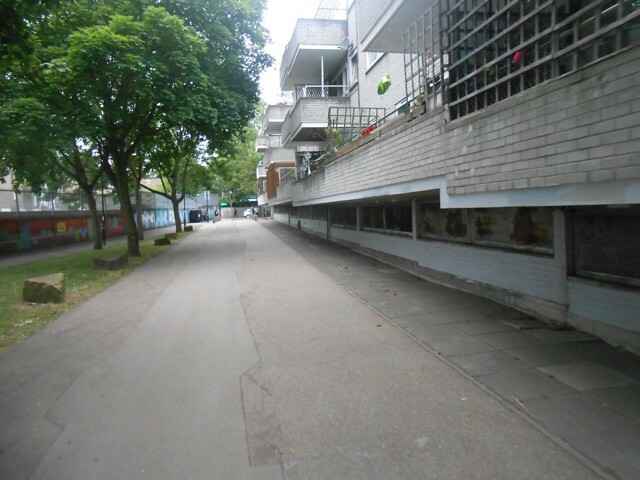 Fleet School: the catchment area is very small – local roads – Pond Street, Lismore Circus, South End Green – occasionally as far as Belsize Park/Aspen Grove. We also looked at some more detailed reports for some of these collisions. We cycled across Savernake Road into Roderick Road, then halted at the intimidating 4-way junction at Southampton Road, Mansfield Road, Agincourt Road and Fleet Road. Cycles have been involved in collisions here, for example: “cyclist and car on Southampton Road waiting to turn right, cyclist moved forward and waited for gap in traffic and car ran into the back of the cyclist”. Turning right from Southampton Road into Mansfield Road is very unpleasant (facing the one-way oncoming stream from Agincourt Rd). This is an unavoidable manoeuvre when coming from Maitland Park Villas. In addition, the approach on Mansfield Road, with the separate left turn lane is not easy for cycling. 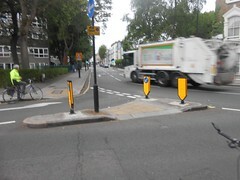 We need a route that avoids this junction for cycling to the schools at Parliament Hill. At Parkhill Road, the wide geometry means that motor vehicles, having already accelerated to beat the lights (at the 4-way junction) or to get ahead of other vehicles, can continue at speed into this side road, risking left hooks. A peak hour rat run, Parkhill’s traffic calming measures and 20mph speed limit fail to deter motorists from impatient and aggressive tailgating – hardly, conducive to those already choosing a sustainable and healthy mode of travel, but moreover, unlikely to entice newcomers to try getting around by bike. This junction need to be dealt with. First option – close it to left turning traffic. The second and preferable option, is for a point closure – to enable children and parents riding to Fleet School, to have at least some sense of being provided for. In the above map, the gyratory is shown as an orange shaded area, around which all vehicles flow one-way in a clockwise direction along Fleet Road, Constantine Road and Agincourt Road. This one-way characteristic is a serious barrier to cycling, often turning a short ride between two of the junctions into a long one round the gyratory. For example, there is no short route between Parkhill Road and Mansfield Road and we saw several examples of pavement cycling during the short time we stood at the south east corner of the gyratory. Another example is a route from Highgate via Savernake Road to Lawn Road, which just doesn’t work in that direction, although the return via Cressy Road, Agincourt Road and Mackeson Road works. Fleet primary school’s bike stands are always taken up with scooters and bikes, and the bikeability training is always fully subscribed. But, few Fleet parents currently allow children to ride to the front gates of their own school and car drop-offs remain unfortunately, a choice for many. It is accepted by campaigners and more enlightened traffic engineers and councillors that cyclists will want to travel the shortest, most direct route possible, which must also be safe. 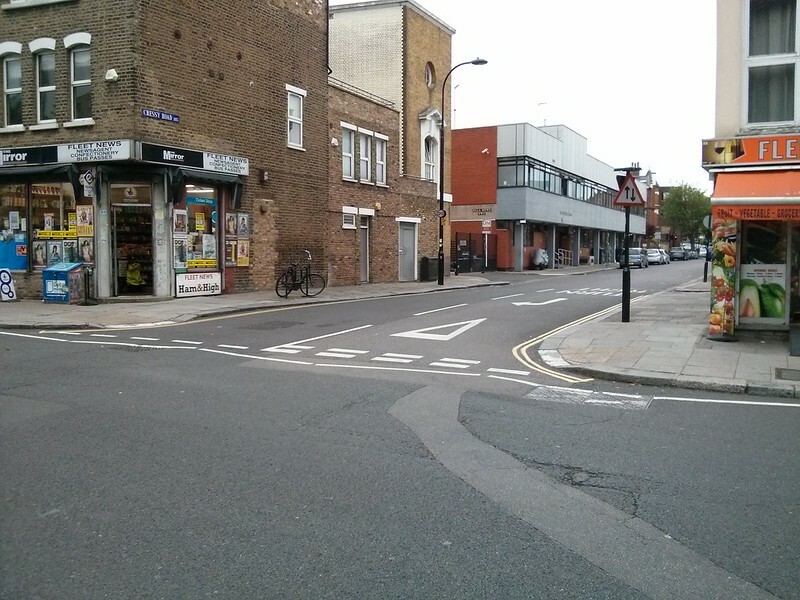 We conclude that it a priority to provide at the very least, a segregated contraflow route for cyclists on the eastern end of Fleet Road, either from Parkhill Road junction or preferably the entrance to Fleet School a few metres on. But ideally the contraflow should go all the way to South End Green. Cyclists can travel the length of Savernake–Constantine, or even ride across the Heath from between Parliament Hill and Savernake Bridge. But when they reach Agincourt Road, the route to South End Green is severed (see StreetView above). 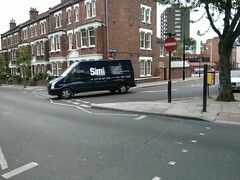 At this point (just a few metres from South End Green), all traffic, including cycles are forced to turn left turn and merge with the the gyratory traffic. By bike, you have to travel virtually the whole gyratory circuit for the want of just a few metres of carriageway-space from Constantine. Clearly cycling was not considered when this gyratory was created. The photo on the right faces towards South End Green (from the junctiuon with Constantine Road) and shows car parking on both sides. 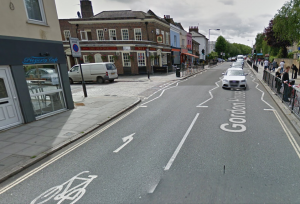 It is essential to provide protected contraflow cycling in this stretch; and the removal of car parking on one side of the road would leave plenty of room. We noted that cyclists travelling South End Green towards the Heath would benefit from an alteration at the junction to improve the sight line to the left. Cressy Road is one-way northbound from the Ambulance Station, which does not allow for southbound cycle journeys. As Cressy Road continues up to Constantine Road we defer discussing it in detail until Section 6 below. When we reached South End Green, we contemplated the absurdity of how such an attractive and appealing destination, with cafes, shops, amenities and a central historic point of focus could have been allowed to become overwhelmed by motor vehicles. 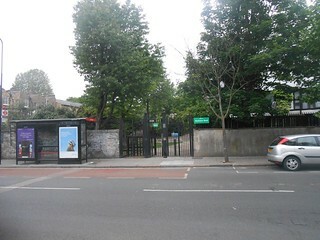 On the left in the above StreetView is an island containing a few public seats and some tall mature trees. Across from here (on the right of the picture), a cobbled area set back from the road provides a terminus for the new no 24 route hybrid buses. A positive factor here is that pedestrians are given priority by the availability of of zebra crossings across all intersections. The road on the left is Pond Street. The junction is organised to give priority to the N-S and S-N motors over those on Pond Street: the drivers’ insistence on their right-of-way makes the junction very unpleasant to cycle through. Replace the junction with a small continental-style roundabout to calm traffic and give everybody a go. This should make the Pond Street-Constantine Road flow much easier. (Mini roundabouts are not recommended for cycling since drivers fail to use them properly. See LCDS 2, Chapter 5 section 5.5.5. We also considered ‘creating a large roundabout to include both the existing triangle and the set back area used as a bus terminus’ The short stretch of road between the two would be closed to all motors and would accommodate the 24 bus terminus (with access for bicycles). 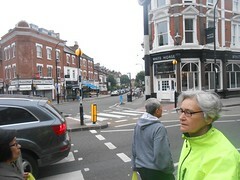 We noted that there is a bus terminus in the middle of the roundabout at Muswell Hill Broadway. Turning left from the Agincourt Road arm of the gyratory enables cyclists to travel in relative safely back to Savernake Bridge, where they can choose to continue towards Dartmouth Park via the Heath or continue along Constantine as it becomes Savernake Road. At Cressy Road you might reasonably expect to be able take a short cut turning right…but no – this is ‘no entry’ and the emerging vehicles have been provided with two lanes. To provide for cycling on the stretch to South End Green would require changes to the existing parking that currently lines both sides of the road from South End Green to beyond the junction at Constantine. Ample space exists on the highway for a contra flow route here. Full segregation from oncoming traffic will be essential. This two part road, stretching from Constantine Road across Agincourt to Fleet Road, is southbound from Constantine to Agincourt Road and northbound from Fleet Road to Agincourt. The pair of “No Entry’s” on Agincourt Road prevents people from cycling right through in either direction, although an alternative northbound route to Constantine is available through Mackeson. However, the latter is not exactly direct and hardly desirable for newer cyclists or those people taking children to the playground just over Savernake Bridge. Two-way cycling should be provided in both sections of Cressy Road. This route was felt to be potentially the quickest and most achievable ‘win’. The photo on the right faces north up Cressy Road across Agincourt Road into the quiet section leading to Savernake Road – that section requires only a lightweight implementation (new signs at each end and logos on the road surface). 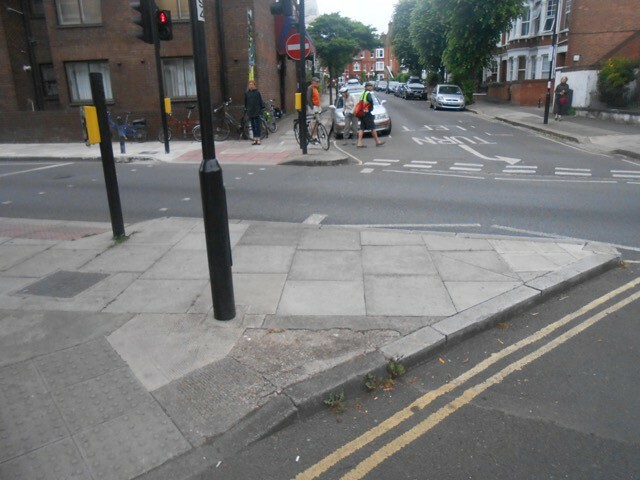 But to provide a direct line for cycling, a cut through the kerb in the foreground is needed. The photo on the left shows the view from Fleet Road up Cressy Road. Cressy Road is one way north of the ambulance station. 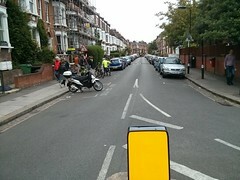 This part of Cressy Road is used at speed by a significant amount of traffic which turns left into Agincourt Road as shown in the photo on the right. The pedestrian signals would provide additional assistance crossing here. A segregated contraflow cycle lane lane is necessary at this entrance from Agincourt Road and continuing as far as the Ambulance Station. A simpler solution would be to close the road to through motor traffic with exceptions for ambulances and hospital vehicles. 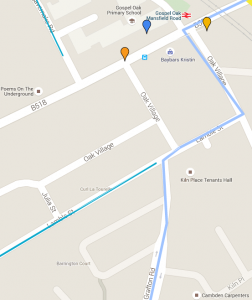 Residents and workers would be able to access Ella Mews from Fleet Road. There is no need for other vehicles to continue this to take advantage of this rat run. The long stretch of Constantine Road east of the junction with Agincourt Road enables cyclists to travel in relative safely to Savernake Bridge, or continue as Constantine becomes Savernake Road. 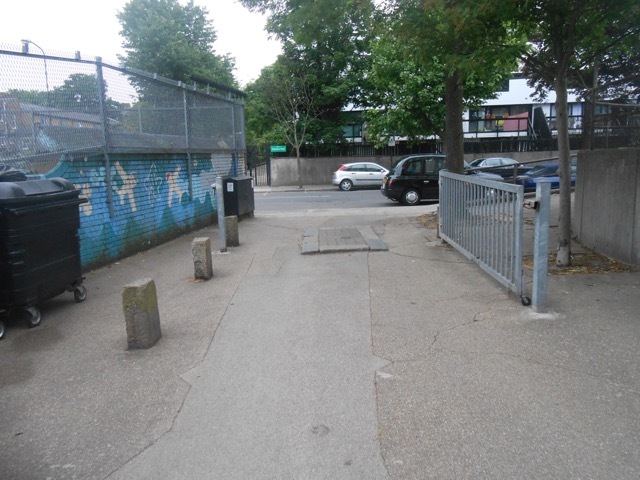 This is a reasonably quiet route to the Mansfield Road junction and accessible to most children in the catchment area of Gospel Oak School. 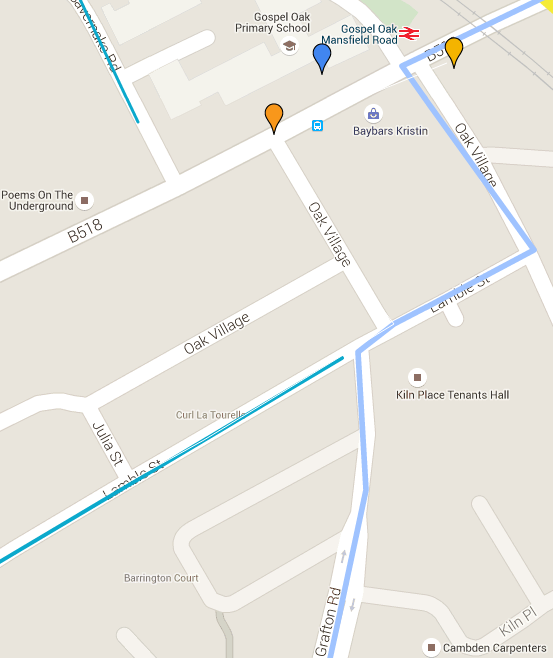 << Steven said: ” also Carlton School a little further (towards Kentish Town)”..do we know its catchment area?>>. Though ‘relatively’ is the key word here, since unfortunately, where traffic can enter and find a way through, it will and does. The speed cushions provide little disincentive for the determined rat runner. Unless residents or visitors, those using this road are doing so as a means of escaping the Agincourt junction traffic lights. A simple point closure is needed here, somewhere between the junctions with Lisburn and Roderick Roads, to prevent peak hour (and midday) rat running traffic and also in turn provide a much calmer and accessible route to Gospel Oak School and to the entrance to the Heath. 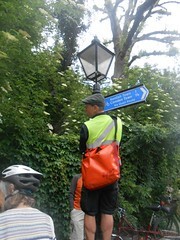 We moved on along Savernake Road turning right onto Estelle Road. At the end we crossed directly to Elaine Grove via a cyclist-only two-way access point, through the road closure, noting the rather excessive size of the bollard. As shown in the StreetView above, this crossing is close to a zebra crossing. We discussed the use of the new hybrid zebras that have parallel routes for cycles. (See LCDS 2, Section 5.2.6). But this design is applicable only when cycles are separated from motors at both ends: in this case, they are only separated as they go into Elaine Grove. We then turned right to look at the existing track from Elaine Grove that runs behind the flats parallel to Mansfield Road with a view to this forming part of a route to the Parliament Hill Secondary schools from the area around Maitland Park Villas. The route could also benefit pupils cycling to and from Fleet school as well as St Dominics a short distance along Southampton Road. The three photos above show the track. On the left, we see that the road surface needs attention. The middle photo shows the exit towards Southampton Road. In addition, some signage will be needed and attention to the details of joining and leaving the track at the two ends. 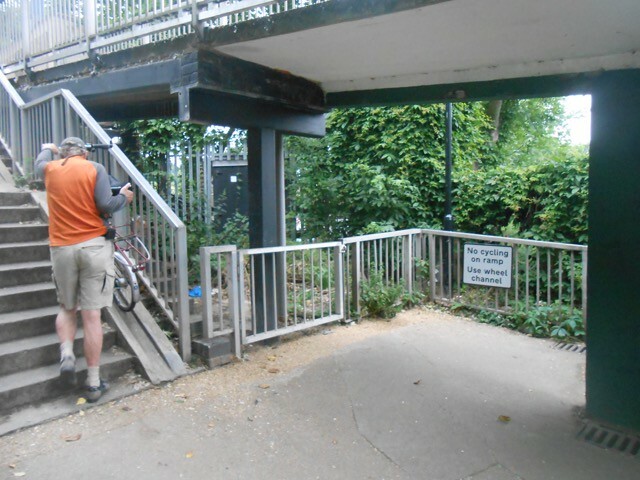 We also noted that the rear of the flats (as shown in the photo on the left) have an overhang that could result in a head injury for a taller cyclist or someone seated in a more upright position – this should be rectified by placing a bollard at the approach with end such has been done at steps leading over the Grand Union Canal at Alperton. On the other side of Southampton Road, immediately opposite a heavy security gate (giving access only to residents, as shown in the photo on the right ) deprived us of the option of travelling an additional short stretch of road that joins Parkhill which, along with another short cut through parallel to Fleet Road would have allowed for a quiet route for school children to arrive virtually opposite the front gate of Fleet Primary. But, probably more significantly, the catchment area for the Parliament Hill Secondary schools includes Belsize Park and the useful cycle route could follow Downside Crescent – Garnett Road but the continuation via Dunboyne Road is blocked by the gated council estate. For our final section, we headed along Lamble Street towards the furthest east of the three roads that are called “Oak Village”, pausing to readjust a cycle route sign – see the map on the left. The Quiet Route from Kentish Town (darker blue line) comes up Grafton Road and the sign northbound seems to indicate the western arm. But on leaving Gordon House Road, the eastern arm is indicated (see StreetView left below). 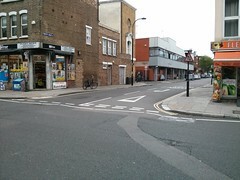 This route is really quiet all the way from south Kentish Town but the part through Oak Village is sometimes difficult due to drivers pushing past – in addition there is a record of several collisions involving cycles at the junction of the western arm with Mansfield Road as well as some close to the junction of the eastern arm with Mansfield Road. It would be simple to separate motors and cycles on this route: the former can use the western arm and the latter the eastern arm which should have filtering to prevent through motor traffic. The signage for northbound cycles needs to be improved to indicate this route that also has the advantage of avoiding a short section of Mansfield Road – Gordon House Road. The Quiet Route cannot continue any further east and the north without passing under the railway bridges shown in StreetView below. Regarding congestion: the locals amongst us reported that morning rush hour traffic is so bad that cyclists cannot get past stationary vehicles due to the additional constraints of the narrow width of the railway arches. 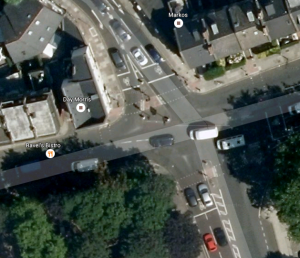 The stretch between the pedestrian crossing outside the exit of Gospel Oak station and the one to the east of the Lido path, alone accounted for 6 collisions, mostly in the 2 years to 2012 – probably the top collision hot spot of the ride. We considered the possibility of having separate cycle lanes and a light controlled alternating 2 way single vehicle lane on the stretch between the bridges where there are currently already pedestrian crossings at either end, and, whether in fact at peak times there would be an adverse effect on congestion levels, given that the traffic is pretty much backed up in any case and may flow more smoothly if in a single lane. Clearly then some radical steps have to be taken elsewhere to dissuade motorists from making excessive and inappropriate journeys along Gordon House Road which is shared with a cycle route. With the Supreme Court Ruling finally having found London in breach of air quality limits (and having had several years of warnings), along with more people waking up to realise the media-contrived silence on climate change will be costly in rather more than monetary terms, allied to the repeated calls for action to curtail obesity etc and subsequent NHS burden, it really should be time to tackle the motor vehicle scourge and make prioritising cycling and walking an actual reality rather than just fine words from a document. In the words of Naomi Klein, we don’t have another ten years. The author of the New London Cycle Design Standards, Brian Deegan, recently coined the term ‘Vision-compliant’ for consideration, as road planners and engineers learn to become aware of their role in undoing the damage wrought by former traffic schemes and layouts upon urban environments. Any piece of existing or intended road infrastructure, that can only be realistically used by existing cyclists (i.e. the brave, the experienced or the foolhardy) will not be perceived as meeting these new LCDS standards, and would fail another test – of meeting the criteria laid out in the new Cycling Level of Service conditions. These inform the Mayor of London’s ‘Vision For London’ document which intends to bring about a transformation in the way people move around the capital. Meaning that travelling by bike should be as easy for ‘anyone aged 8 to 80’ to do – the actual and subjective dangers facing current cyclists having been removed from the equation. Based on the minimum parking space, 3 million London registered private cars take up 34.560 km2 for parking. The congestion zone is 21 km2 so the equivalent of the whole of zones 1 & 2 is taken used up by parked cars. These figures excludes commercial vehicles and those visiting London by car. In London in 2001 there were 6.8 million parking spaces (Transport Statistic Users Group), which, based on the minimum parking space provided uses up 32.33 square miles of road space or 78.33 km2. But added to this is access area, meaning these incredible figures could be underestimated by 100%. To quote the BMA: The provision, cost and accessibility of parking influences driving behaviour. Parking also creates obstructions that can impair visibility of pedestrians to drivers. This can affect road safety and uptake of active travel, as well as contributing to community severance. The THSG (TSUG) have suggested that the provision of free parking in residential, commercial and town centres effectively subsidises car use, distorting the real costs of driving. This is because the costs of providing free parking are partially incurred by local authorities and commercial businesses.